Bleach and laundry issues continue to confuse me. Use it to remove the caked on mildew and grime that is growing on the back of a vinyl shower curtain liner! I’ve heard that you should use vinegar to wash the shower curtain liner in your washing machine. That has always worked so-so for me. But this weekend, we were out of vinegar, so I used Bleach instead. That the bleach would stain the vinyl, leaving us with a white-spotty shower curtain liner (that was a deep lavender to start with). Neither actually occurred, and I couldn’t be happier with the results! This shower curtain liner looks like NEW. FYI: I used about a 1/2 cup of bleach and enough liquid detergent for a full load of wash then ran it through the complete cycle in the washing machine. 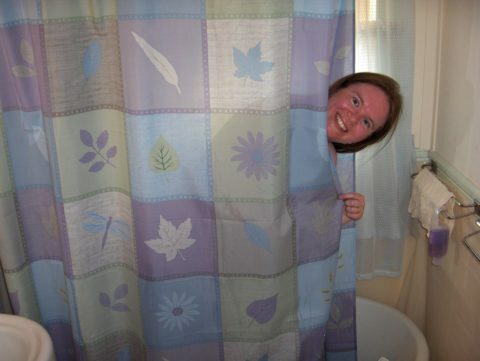 Put your shower curtain in the washing machine with detergent, a 1/2-cup of salt, and a fluffy towel. Supposedly, the salt clinks to the curtain and repels mold and mildew. The towel balances out the laundry load.